Bedford Blues have announced that fly half Steffan Jones will be returning to Goldington Road permanently following his involvement with Wales in the HSBC Sevens World Series. Jones, 24, had joined the Blues in the summer on a year long loan move from Newport Gwent Dragons but was recalled by the region in early November before heading off with the National Sevens Team. Following displays in Dubai and South Africa, Jones returned home for Christmas before finalising a permanent move which sees him switching Rodney Parade for Goldington Road where he had made eight appearances scoring one try, three conversions and two penalties. Jones initially came through the developmental ranks at Newport Gwent Dragons and was on a dual contract with Cross Keys where he impressed during the 2010/2011 Premiership season when he made 24 starts and one substitute appearance for the Keys and scored over 300 points. Speaking about the signing of Jones, Blues Director of Rugby Mike Rayer said: “We are really pleased that Steffan has decided to join us following his return from international duties and very grateful to the Dragons for his release. 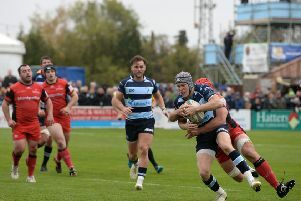 Jones is back training with Bedford Blues and could be in line to take a place in the squad when Doncaster Knights visit Goldington Road on Saturday afternoon in the Greene King IPA Championship. To book your discounted rate ticket, visit www.bedfordrugby.co.uk.